Can y'all believe Christmas is only two weeks away?!.. I know I can't! 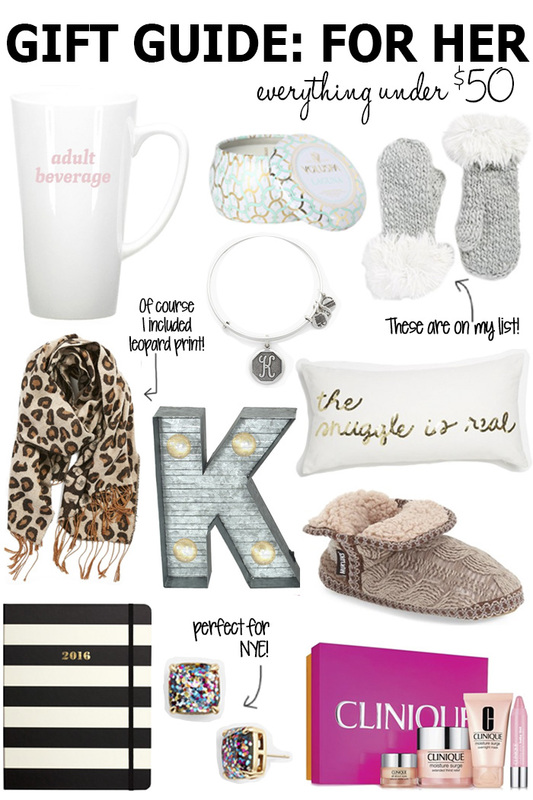 With the holidays just around the corner, I figured I would create a gift guide for all the ladies in your lives. Everything in this gift guide is less than $50 and can be found at Nordstrom. These gifts would make the perfect present or stocking stuffer for your mom, sister, roommate, best friend, whomever! -- this guide has something for everyone! Speaking of Christmas, has anyone gotten their trees yet?? We got ours last weekend and it was an exciting experience. I just moved into a house last month with my friend and boyfriend, so this is the first year getting a tree of my own (outside my parents house). I have been collecting Christmas ornaments for the last couple of years and I finally have a place to hang them! Who else loves the holiday season as much as I do? What's on YOUR Christmas list?! I would love a surprise visit from my family for Christmas!